1 Put the salt in a saucepan of boiling water, then add the pasta bring to the boil and turn down to a medium to high heat. 2 In a heated frying pan or wok toast to pine nuts until golden colour, then remove from the pan and set aside. 3 Add the oil and move the oil around the pan then add the onion and orange pepper, then stir before adding the courgette and mushrooms, then stir again and turn down to a medium heat. 4 After about a minute add in the cracked black pepper and the chilli flakes and stir and cook leave to cook for another minute. 5 Add in the pesto and stir into the ingredients add 2 serving spoons of the water from the pasta to the vegetables and stir. 6 When the pasta is cooked until ‘al dente’ add it to the vegetables and stir well making sure the pesto sauce coves the pasta. 7 Then add the baby spinach and fresh basil leaves and stir into the pasta until wilted, before adding the tomatoes, mix and leave to cook for 1 minute. 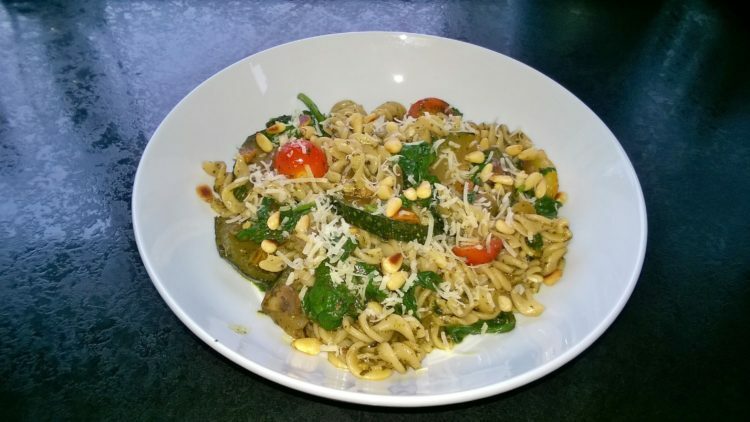 8 Then serve into to pasta bowls then garnish with a sprinkle of toasted pine nuts and the grated parmesan cheese, enjoy.